The internationally acclaimed 20-piece Jazz Composers Alliance Orchestra will present music by director Darrell Katz in a concert to celebrate the release of their new CD Why Do You Ride? 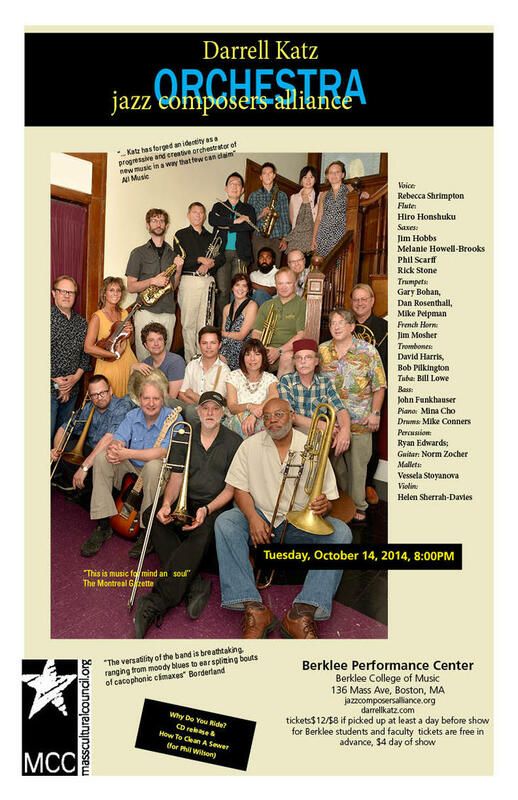 on Tuesday, October 14 at the Berklee Performance Center, 136 Massachusetts Avenue, Boston, MA. Tickets are $12; $8 if picked up at least a day before the show. With Berklee ID tickets are free in advance, and $4 day of show. The centerpiece of the new disc is Wheelworks, an eight-movement suite consisting of settings of things that Albert Einstein did and did NOT say about the learning, knowledge, love and war, and exquisitely sung by the voice of the JCA, Rebecca Shrimpton, who, over the years, has proven to have such great skill at bringing musical ideas and text to life. How To Clean A Sewer, for Phil Wilson, features Shrimpton, and the marimba/violin duo of Vessela Stoyanova and Helen Sherrah-Davies, all within the JCA Orchestra and is Katz’s second “improvisational concerto grosso” for this combination of a group within a group. It contains texts by poet Paula Tatarunis, and philosopher Simone Weil. Why Do You Ride? (October 14, Leo Records)is the group’s 10th CD. Arriving on the cusp of the JCAO’s thirtieth anniversary year, Why Do You Ride? shows off Katz’s deft ability to juggle off-kilter modernism with electrifying dynamic shifts and a tumult of jazz-history reference points in his vivid, smash-cut big band arrangements, all combined for this excursion with his love for cycling and his less-than-thorough internet research standards. The results are executed by an expert ensemble that tempers virtuosity with a liberal dose of irreverence, precisely navigating hairpin turns while maintaining just enough danger to make you believe you just might go off the cliff into total chaos. “The band plays with drive and vitality. The soloists responding with imaginative fire to the charts and the ensemble. This is contemporary big band music of a very high order, written and played with considerable skill and integrity” – swing2bop.com/reviews.